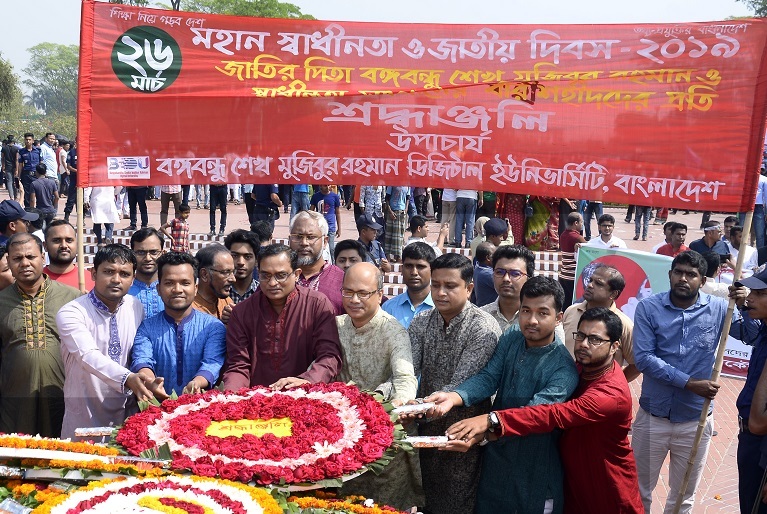 Bangabandhu Sheikh Mujibur Rahman Digital University (BDU) Vice-chancellor (VC) Prof Dr Munaz Ahmed Noor paid rich tributes to the martyrs of the War of Liberation by placing wreaths at the National Memorial in Savar on Tuesday morning marking the 49th Independence and National Day, said a press release. Later at 12:00 pm, VC Munaz paid homage to Father of the Nation by placing a wreath at his portrait in front of Bangabandhu Memorial Museum at Dhanmondi in the capital. Among others, Md. Ashraf Uddin, Director of Finance and Accounts of the university, Senior System Analyst Muhammad Shahinul Kabir and other officers and employees of the university were also present.